A rubdown with butter and herbs and slow roasting result in a wonderfully juicy roast plus drippings that lead to a dark, rich red-wine gravy. This gluten free dinner recipe, from our book-club buddy Tara Brooke, calls for fresh herbs, but dried work, too. 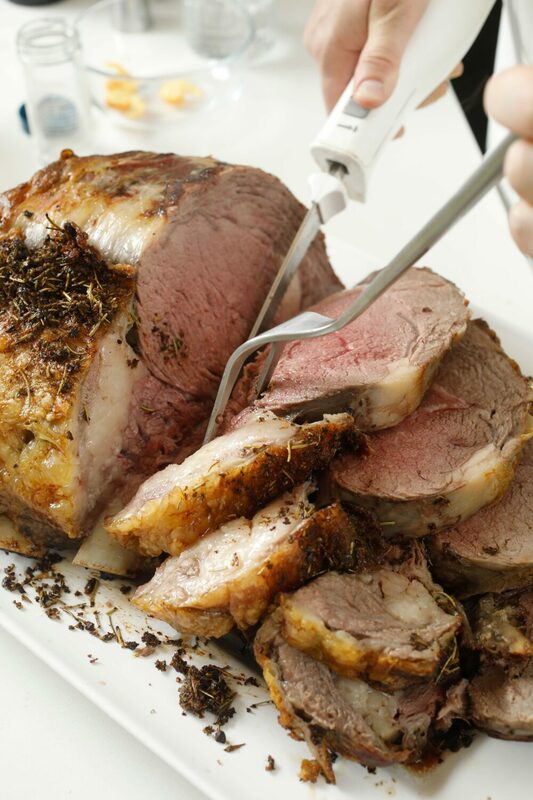 When figuring out how big a roast to buy, consider that one rib feeds two people (a four-rib roast serves eight). Have your butcher cut the meat partially from the rib for easiest carving, then tie it, and expect, after the initial 15 minutes of cooking at high heat, for the meat to cook 13 to 15 minutes per pound for medium rare. But don’t chance it: Ensure perfect doneness with a meat thermometer. Preheat the oven to 500°F. Put the prime rib in a roasting pan bone-side down, rub all over with the salt, and let sit at room temperature for 1 hour. Blot with a paper towel to remove any moisture. In a small bowl, combine the butter, rosemary, thyme, basil, oregano, pepper, and crushed garlic. Massage the herb butter all over the prime rib, then roast in a roasting pan, bone-side down, for 15 minutes. Lower the temperature to 325°F and continue to cook for 2 hours or until a meat thermometer inserted into the center of the meat reads 120°F. Transfer the meat to a cutting board and let rest for 15 minutes (it will warm to 130°F while resting). Meanwhile, make the gravy: Place the roasting pan on the stovetop over medium heat, add the red wine, and stir for a few minutes, loosening any brown bits stuck to the bottom of the pan. In a small bowl, mix together the butter and the flour until combined. Add half of the butter-flour mixture to the pan and whisk until dissolved and well combined. Slowly add the broth and stir until the gravy thickens to your desired consistency, adding the remaining butter-flour mixture halfway through. Season to taste with salt. Slice the meat and arrange it on a platter, transfer the gravy to a gravy boat, and serve.